Chia puddings make it quite acceptable to eat pudding for breakfast. 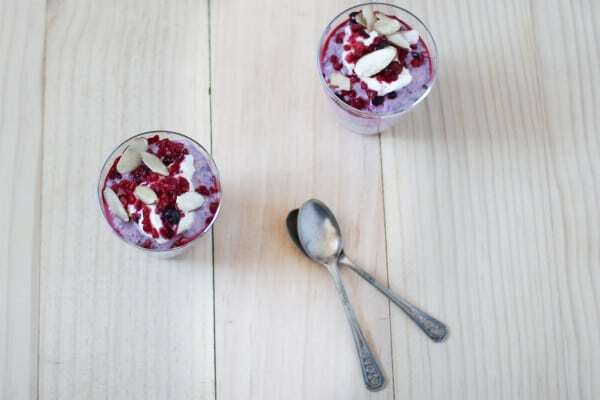 This berry chia pudding with Greek yoghurt is a new recipe I tried out recently and makes a delicious, filling breakfast. Chia seeds are pretty amazing little things. They’re really nutritious, and a special chia seed feature is that they swell up and absorb lots of fluid. So with just a small amount of seeds and some other yummy ingredients, you get a big fluffy pudding that’s full of good nutrition. When I first saw chia pudding it reminded me of sago which kind of grossed me out as a kid, but it doesn’t taste the same and I think the texture is nicer. The good thing about chia puddings is they are simple to make and the only thing that is time consuming is letting the seeds soak up the liquid. 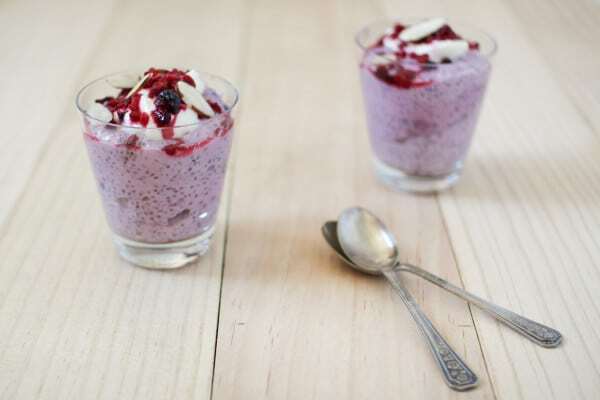 This recipe for berry chia pudding with Greek yoghurt is a source of calcium, fibre, plant based omega 3 fats and protein. It’s a nourishing mix that is quite light but will help keep you feeling fuller for longer. You can double the recipe so you’ve got some in the fridge for a few days too. Extra yoghurt, berries and nuts for serving. Mix together all the ingredients and place in small glasses in the fridge for 2-3 hours minimum, preferably overnight. In the morning, top with the extra Greek yoghurt, nuts and berries. You could also add a sliced banana if you needed a more substantial breakfast. Just checking the coconut is either fresh flesh, or dried/dehydrated flakes, shredded or desiccated, or it is coconut water (the usual liquid I usually soak chia in, never used just yoghurt) or oil even? Ta!